Preheat the oven to 350°F and line a baking sheet with parchment paper or a silicone baking mat, and set aside. Season both sides of the chicken breasts with salt and pepper, to taste. Heat a grill pan, or an indoor grill over medium-high heat. Coat it with nonstick cooking spray, and grill them on each side, just long enough to get grill marks, about 30 seconds to 1 minute on each side. Take the chicken off the grill and let them rest for a few minutes on a cutting board, until cook enough to touch. Only the outside of the chicken will be cooked, the inside will still be raw. Butterfly each chicken breast, by slicing them lengthwise without cutting all the way through, and open them like a book. Season the inside with salt and pepper, to taste. 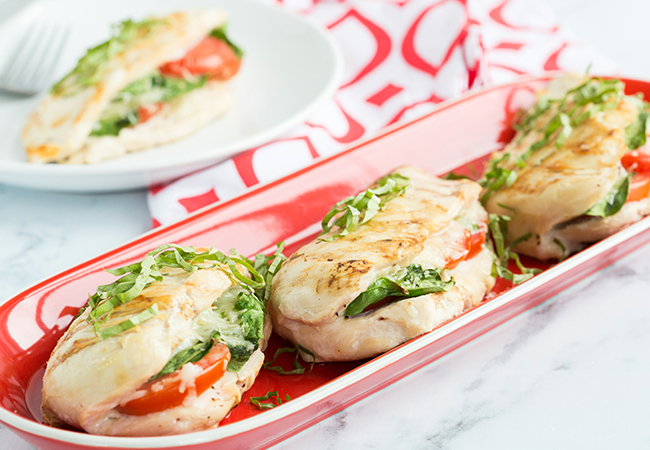 Fill each breast evenly with the spinach, tomatoes, and cheese. Close the butterflied breasts, and use 2 toothpicks to keep them closed with baking. Transfer the breasts to the prepared baking sheet and bake for 10-12 minutes, or until done. Let them rest for 5 minutes, then remove the toothpicks and serve.